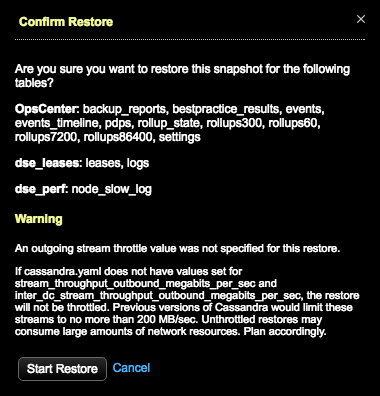 For a point-in-time restore, OpsCenter intelligently chooses which snapshots and commit logs to restore from based on the date and time you are restoring the cluster to. If an acceptable combination of snapshots and commit logs cannot be found, the restore fails. A detailed error message is visible in the Activity section of the OpsCenter UI. For point-in-time restores to work, you must have enabled commit log backups and performed at least one snapshot backup before the time to which you are restoring. When performing a point-in-time restore, the cluster topology must not have changed since the backup. Attempting to perform a point-in-time restore on a cluster whose topology has changed results in a failure. 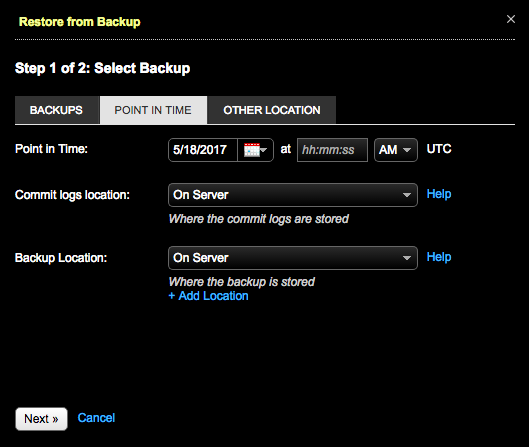 DataStax strongly recommends performing a snapshot backup both before and after changing the cluster topology. After changing the topology, you can then restore the cluster based on that backup. If reverting to the previous topology, you can use the backup with the original topology to restore the cluster. Point-in-time restore cannot restore commit logs for keyspaces or tables that would have to be recreated in Cassandra 2.1 and later, and DataStax Enterprise 4.7 and later. Required: Point in Time: Set the date and time to which you want to restore your data. Required: Commit logs location: Select the location of the commit logs; either On Server, Local FS, or another location on Amazon S3. The location of commit logs is configured when enabling commit log backups. Required: Backup location: Select the location of the snapshot; either On Server, Local FS, or Amazon S3. Click the +Add Location link to add another location. Optional: Click the Edit Restart Settings link to adjust settings for the rolling restart. The default is a 60 second pause after restarting each node. Point-in-Time restores require a rolling restart of all nodes. OpsCenter retrieves the backup data and sends the data to the nodes in the cluster. A snapshot restore is completed first, following the same process as a normal snapshot restore. After the snapshot restore successfully completes, OpsCenter instructs all agents in parallel to download the necessary commit logs, followed by a rolling commit log replay across the cluster. Each node is configured for replay and restarted after the previous node finishes successfully.